Frank Benny brought his wit and wisdom to radio audiences for more 40 years, about half of that time in Buffalo. 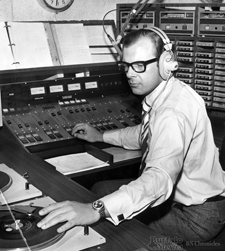 The man born Frank E. Biniak moved to Buffalo's WGR in 1966 after previous stops in Ridgecrest, California (KIKS), Portland, Oregon (KEX, KISN) and Cincinnati (WUBE). He stayed 19 years in the Queen City, mostly in afternoon drive, while also serving as the weatherman for WGR-TV and hosting Bowling For Dollars five nights a week (he also found time to do telethons and a movie matinee). He left WGR in 1985, did the morning show at WYRK for a year, then moved to WBEN AM & FM. Benny, an avid golfer, moved to Florida in 1989 where he worked at several stations including his last stop, WENG Sarasota, Florida, where he co-hosted the morning show. "He would have liked to be remembered with a microphone in one hand and a golf club in the other," his companion Lynda Sawkes told Portland Radio Guide. "He was the master of the one-liner, he could fire them off as quickly as Johnny Carson." Benny died May 9, 2005 in Sarasota at age 67. Enjoy Frank Benny on WGR (UNSCOPED) here. Enjoy Frank Benny on WGR (SCOPED) here.